Intel Xeon Phi is quite a name in the HPC sector of the processing market. The Xeon Phi is basically a coprocessor, basically not limited in power like a true CPU, and on the other hand not completely dependent on the CPU like a GPU. The Coprocessor is a hybrid, with the brute power of the GPU and independence of the CPU. 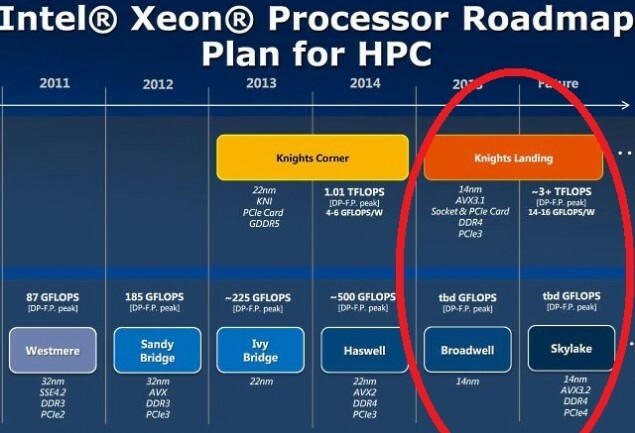 Broadwell 14nm Based Intel Xeon Phi Coprocessor Announced – Power Tripled over Last Gen. The new generation of the Intel Coprocessor dubbed ‘Xeon Phi’ will be codenamed ‘Knights Landing’ and roughly triples (wow) the performance of the previous generation. 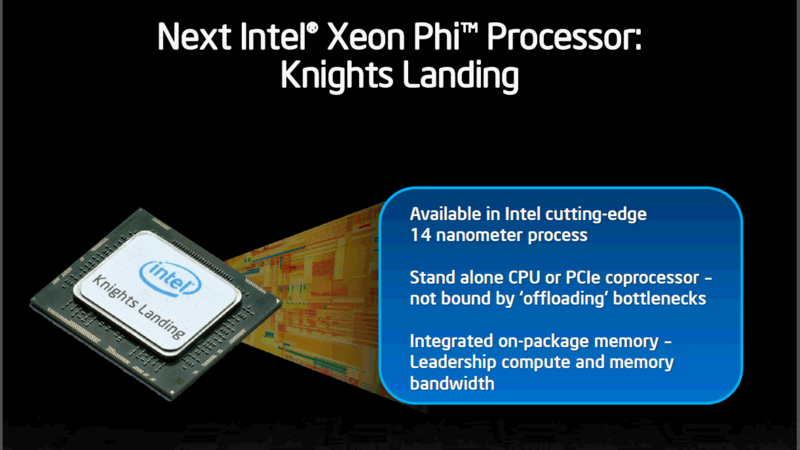 Knights Landing Xeon Phi will be made from Broadwell Architecture and produced using the 14nm fab process. The card is supposedly going to debut in two forms this time. One the classic GPU Form Factor and the other a new LGA Socket Form Factor. The LGA Socket form factor will supposedly cut production costs significantly while keeping the performance drop (if any) at negligible levels. And if you think that 3 Tera Flops of Double Precision is not alot then see this, Nvidia’s newest flagship the Tesla K40 only manages a bare 1.33 TF on DP. AMD’s flagship goes upto 1.48 TF, still half that of the Intel Coprocessor. And thats not it, you would need a CPU coupled with the aforementioned GPUs for them to work, Xeon Phi can work completely independently. 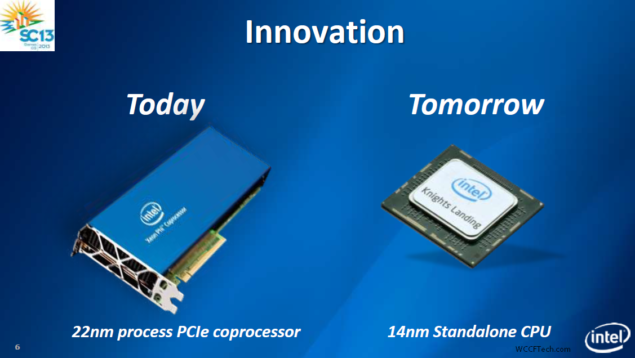 Whats more, the Intel Coprocessor is already cheap (Relatively! ) and with the new LGA form factor, expect price to go down even more. They will soon enter the range of the high end Xeon products. Last generation’s flagship supported only 61 cores. Knights Landing will have around 72 cores. It will feature AVX 512 and 384Gb worth of Bandwidth. One things for sure, the time is coming when amateurs would have the power of small supercompute clusters in their rigs.